As vibrant as the art, artisan and maker scenes are in Nashville, it’s relatively pain-free to find inspiring, one-of-a-kind decor and furnishings here — throughout the year, various craft fairs and maker markets offer the perfect places to shop. Among the best of the bunch: Tennessee Craft’s annual spring and fall Craft Fairs, which feature hundreds of local, regional and national artists, hand-picked to share their wares. The 2017 Fall Fair is coming up soon: It’s set for Friday, September 22 through Sunday, September 24, again at Centennial Park in Midtown (2500 West End Avenue). A crop of 200 makers are set to be there, with work spanning styles, methods and media, from hand-formed pottery to hand-hammered jewelry. We’ll be hearing a lot more in the weeks to come about what we’ll be able to browse for and buy at the 2017 Tennessee Craft Fall Craft Fair, but we’ve been keeping tabs on some of the early announcements, and already have a list of booths we’re aiming to check out. Below, a quick peek at the kind of stuff you’ll find at the Fair, with a particular focus on home goods (with helping people buy and sell Nashville homes day in and day out, that tends to be where our minds go). Self-taught furniture designer Kelly Maxwell specializes in wood slab and live-edge wood furniture, from dining tables to mantels, so no two pieces are alike, and no one piece is anything akin to boring. 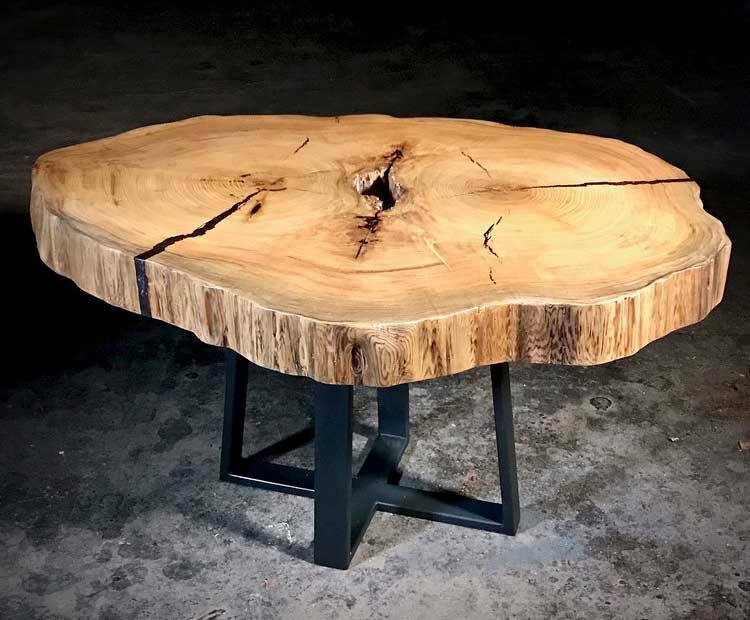 His studio/gallery is in downtown Nashville, at 901 2nd Ave. South, but you’ll also be able to see and buy pieces at the Craft Fair — like this cypress log table. 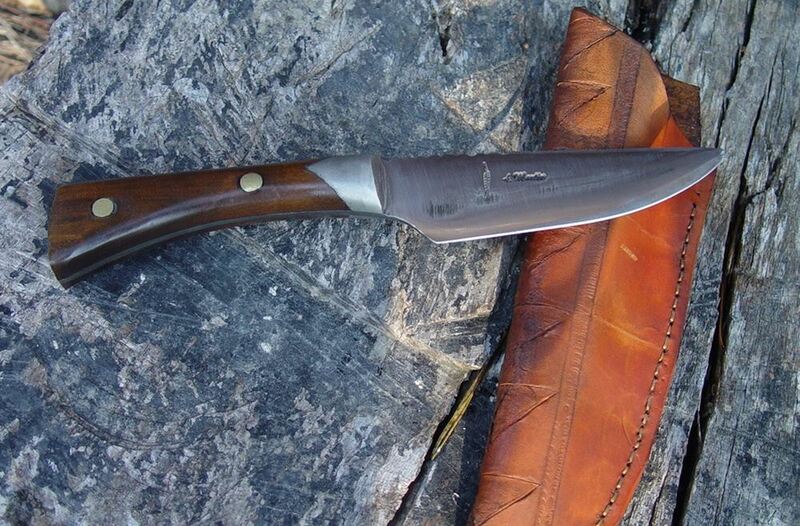 Fairview blacksmith Anthony Martin focuses on period pieces — from his Red Tail Forge Works, you can find anything from knives made from railroad spikes and detailed tomahawks to fireplace-stoking tools you’d think came straight from colonial times. 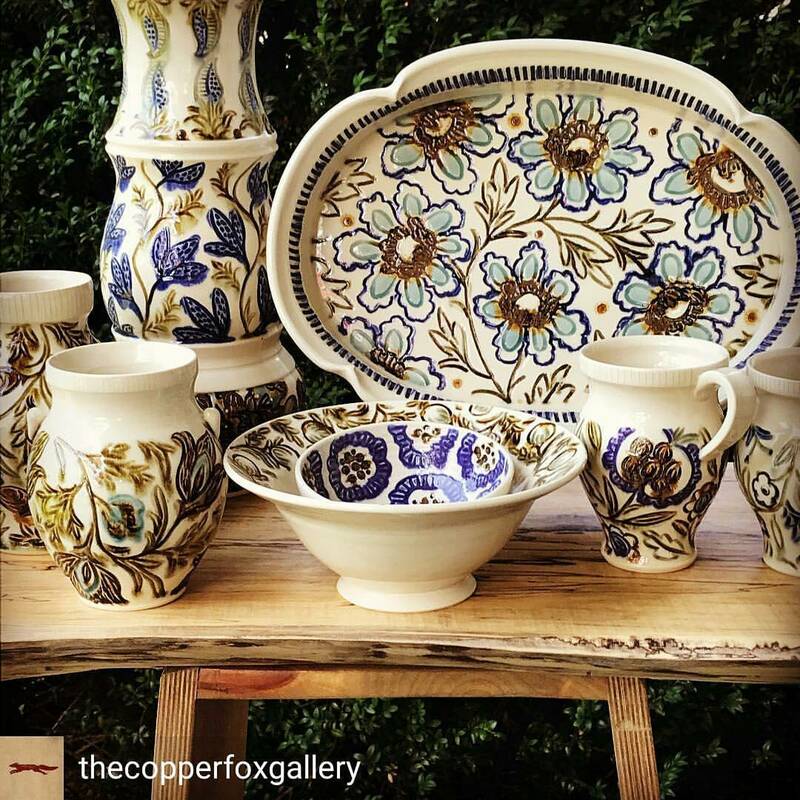 Nashville potter and sculptor Deal-McEver is a creator and teacher — along with sharing and selling work like the intricate hand-carved dishware pictured above, she teaches at Vanderbilt University’s Sarratt Art Studios and hosts pottery classes and workshops around Middle Tennessee, and in her home studio. 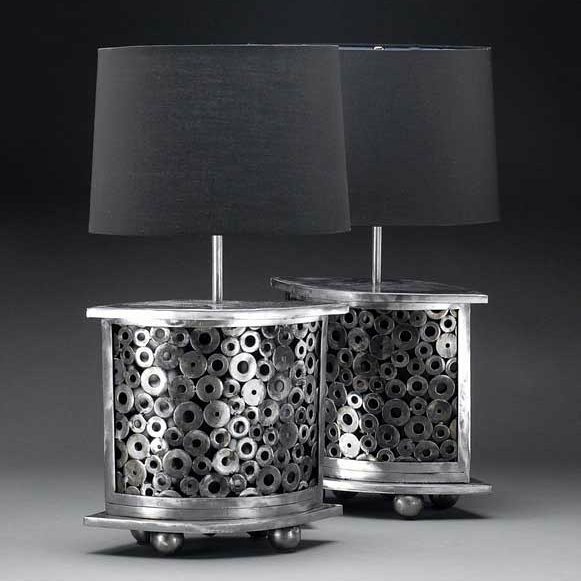 Ohio-based artist Dean L. Myton reinvents the discarded into the beautiful and useful — think tossed-out wine crates turned into serving trays, or recycled washers welded and polished into lamps, pictured above. 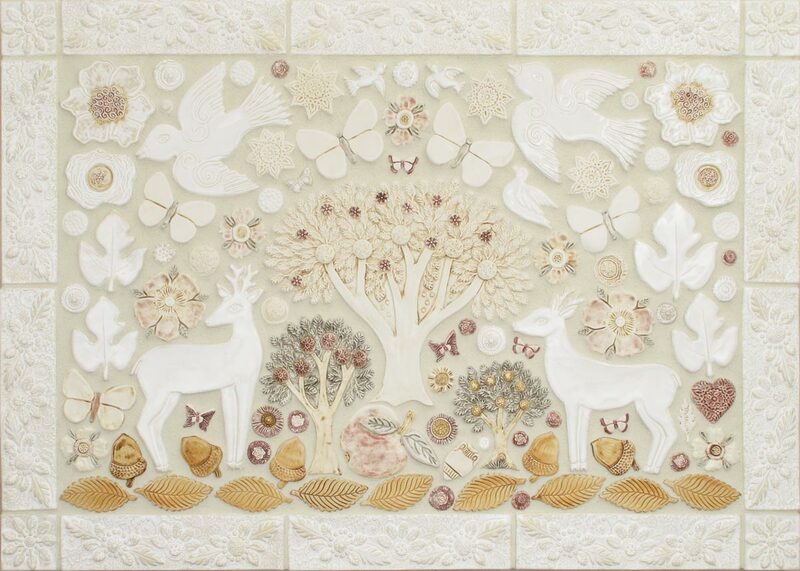 North Carolina’s Lisa TeviaClark and Jim Clark work with high-fired porcelain, semi-precious stone, common stone and cultured pearl to create incredibly intricate mosaic art pieces, ranging from serene, beachy textures to whimsical woodland scenes. They’re as durable as they are beautiful, too, so pieces can be installed anywhere from a fireplace surround to a shower wall. Any of these artists’ work catch your attention? Keep up with more spotlighted contributors at the Tennessee Craft Facebook page. As with every year, the Tennessee Craft Fall Fair is free, and offers lots to do on top of shopping, from live demonstrations to kids activities. Learn more at TennesseeCraft.org. If you’re not quite ready to shop for furniture and art, but you’re gearing up to buy a new home in the Nashville area, we’d love to help you. Reach ACRE here, or for an easy way to get your Nashville househunting process started, fill out this quick form. You sure picked some of the special ones! Leading your audience to the home goods makes great sense. Know also we post a “virtual fair” on our fair event page, where folks can search by medium and pre-plan their visit, or connect after the fair. Thanks for leading people to our Facebook page too, where we post videos of the fair and photos of work you’ll find.